Your house may be ready to take on 2017, but is your garden or outdoor space? This year, you may notice some old trends gaining new tweaks, and some completely new ways of gardening creeping into backyards. Brightly-colored, unique plants, living green walls, and areas to relax and entertain are among the biggest garden trends for the new year. 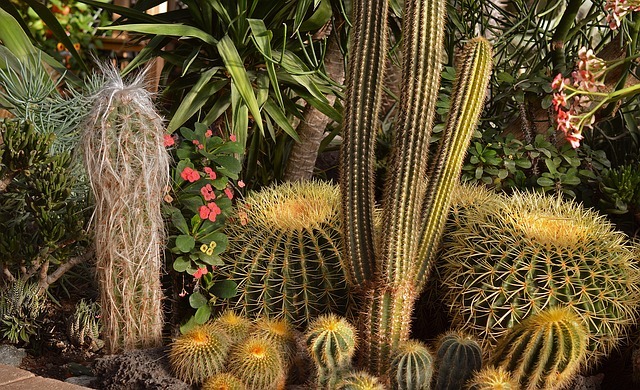 We are starting to see a shift from planting gorgeous flowers and greenery to planting bold, unique cactus and succulent gardens this year. Over the past year, you may have noticed the seemingly out-of-nowhere rising popularity of succulents, which are closely related to cactuses and have thick, long leaves to store water in. Cactuses and succulents are no longer just for planting in a small pot in your kitchen. Gardeners are now making full gardens with succulents the star. With so many textures, colors, and unique shapes available, you can have one of the most eye-catching gardens around. And, thanks to Pinterest, you can find plenty of projects for your succulents after they’ve grown, from jewelry to nail art! Homeowners have a desire for more than just a garden. In addition to a beautiful landscape, they want functional entertainment areas to enjoy as much of their outdoor area as possible. Active playgrounds, basketball courts, sand boxes that double as a volleyball court, and open dog areas are on-trend for the new year. Double up an active area with a few relaxing features, like a fire pit, lounge chairs, or a hammock. Not only will an active space keep your family moving, but it will also become less work for you when it comes to mowing, weeding, and caring for your garden. A liveable outdoor space within the garden has been popular for years now. But, 2017 is bringing a few notable changes to this feature. Rather than focusing on making the living space the central point of the outdoor area, the new focus is on the beautiful garden surroundings. People want a comfortable way to enjoy their own backyards, while also providing enough space and function for families and friends to enjoy. Consider adding a skirted parsons chair or two to create a comfortable nook on your patio that overlooks your garden views. Keep the nook somewhat separate from your functional entertaining areas so you have a relaxing getaway right in your backyard. With crazy climates and unpredictable weather, gardeners are beginning to take more of their gardens indoors, so their plants, flowers, and produce can be enjoyed year-round. You can grow several herbs right on your kitchen counter, or use heat lamps to grow your own vegetables indoors. Not only is it a convenient way to have your herbs and produce available at your fingertips, but as you get more experienced, you can learn to stagger your planting so you’ll have fresh foods available all year round. Start with easy-to-grow produce, like potatoes and garlic, that you can grow simply by placing pieces of them into prepared soil. There is no reason why urban-dwellers and other people with little to no yard space can’t have the garden of their dreams. Living green walls, also known as vertical walls, have been slowly creeping up the trend list the past couple of years, but are sure to be right at the top this year. You can create a living green wall outdoors or indoors, and both can be equally as eye-catching. Plus, the right types of plants can provide cleaner, more breathable air and can even improve your mental state. Especially in urban areas where it’s difficult to find much greenery, living green walls can add more natural elements. They can also help urban-dwellers block out some noise and conserve heat. Subscription boxes for virtually everything have become huge over the past year or two. But, did you know you can order gardening supplies straight to your front door? This is the new way to garden this year, and it really couldn’t get much easier. The trend is moving right along with the popularity of planting indoor gardens. Several different subscription box companies will send you different seeds, soil samples, containers, and even gardening tools each month. You’ll have everything you need to begin a fruitful garden, right out of a box. garden, green walls, plants. Bookmark.